New Football Kit Inspires Victory! 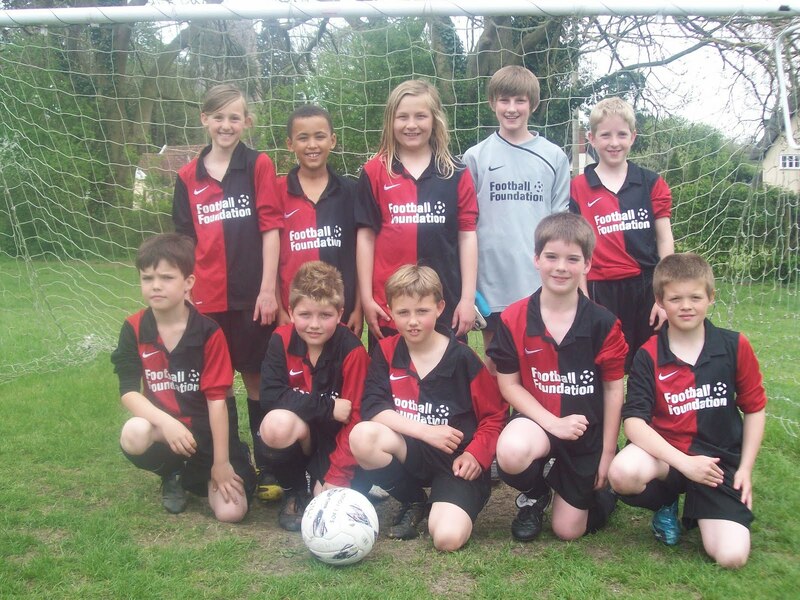 Earl Soham took to the field looking resplendent in their fantastic new kit, courtesy of the Football Foundation. It's been a hard few years for the footballers of Earl Soham, but following many hours of hard work on the training ground a victory in a league match was finally secured at 4.24pm on Thursday 29th April 2010. Earl Soham 2 Bedfield 1. It was a determined all-round performance from all ten of the players who thoroughly deserved their victory in a close fought, but friendly game. Children and their families from both schools should be delighted in how well everyone conducted themselves before, during and after the game. This morning, two visitors joined us for assembly. 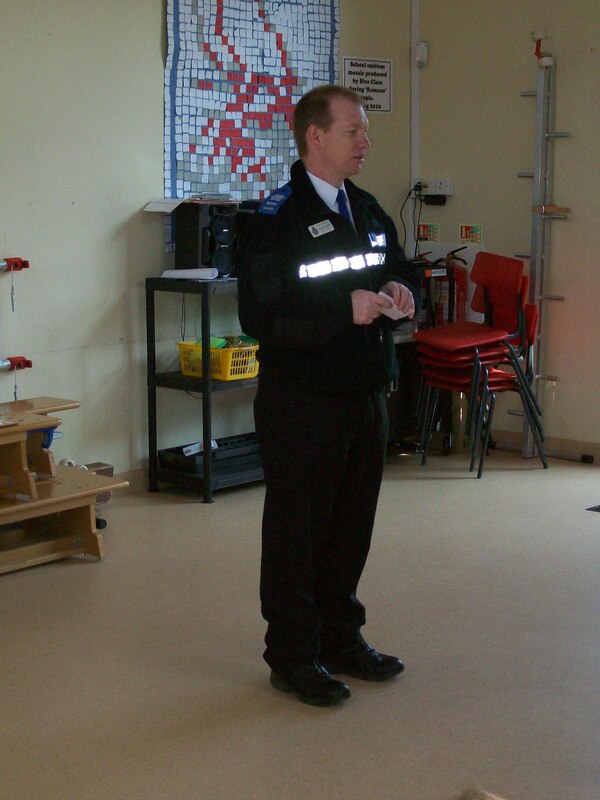 PCSO Christian Hassler and Ann Battershill - Road Safety Officer (Education) explained the importance of keeping safe on the roads and how this can be achieved. 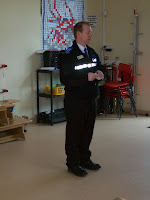 Children were asked a variety of questions and those with the correct answers were awarded with a reflective strip to help them get seen in the dark. The school is looking to appoint two new Junior Road Safety Officers who will take part in a range of activities aimed at developing the children's understanding of road safety. Christian and Ann also set a competition for the children to create a poster relating to improving safety and developing awareness. All children today received either a reflective 'KILL YOUR SPEED NOT ME!' bag sticker or a bright orange swim bag with the same message. 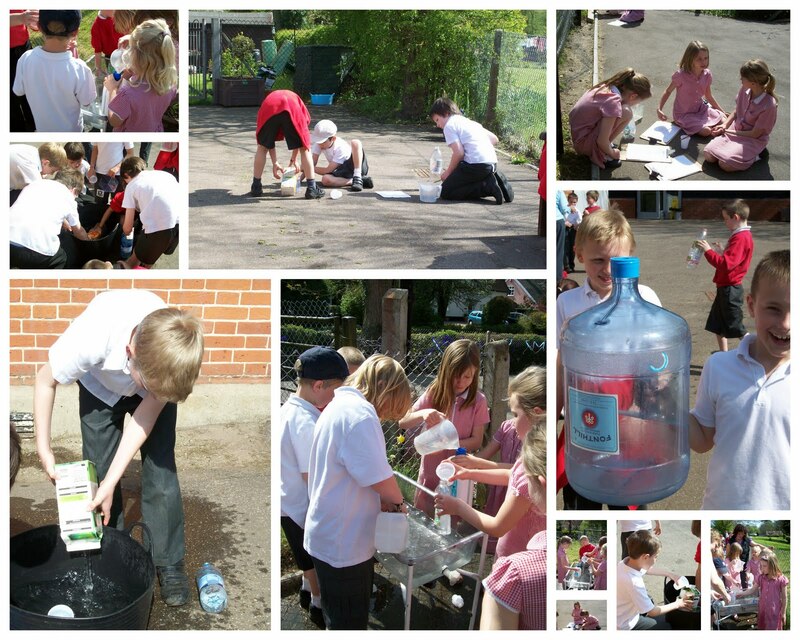 Yellow class made the most of the fantastic weather to undertake some work on capacity as part of their numeracy. 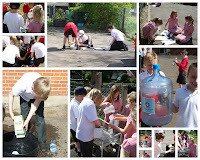 Some children were estimating how many cups of water it would take to fill a range of containers, whilst others were using measuring equipment to work out the capacity of different containers. Some of us managed to stay dry! 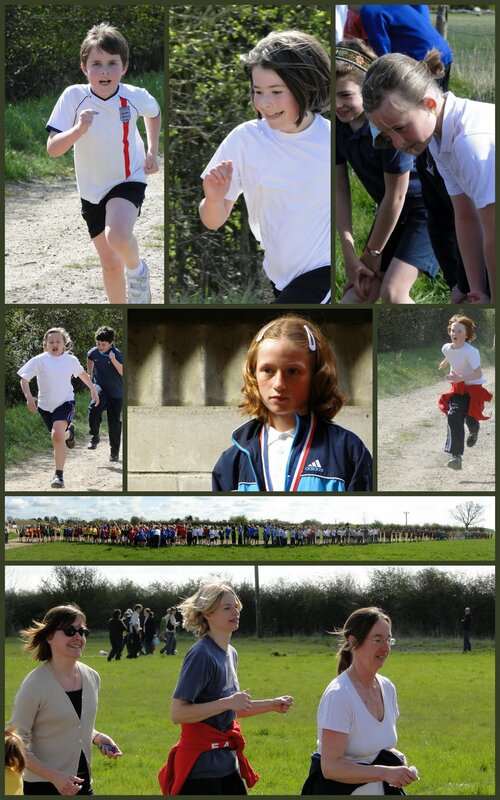 Children in years 4, 5 and 6 took part in the Cross Country race in Stonham Aspal last Thursday morning. 213 girls and 249 boys from local schools took part. For some, finishing the course (a gruelling two-and-a-half miles) was enough. But others were striving to reach the next round and achieved their goal of coming in the top 25. Overall, we had one podium finish (second place) and five top 25 places. Just a reminder that the Summer Term starts on Tuesday 20th April. Monday 19th is a Professional Development day for staff. All after school clubs will start the week commencing 26th April with the exception of FilmClub which will be showing Fantastic Mr Fox on Friday 23rd April. 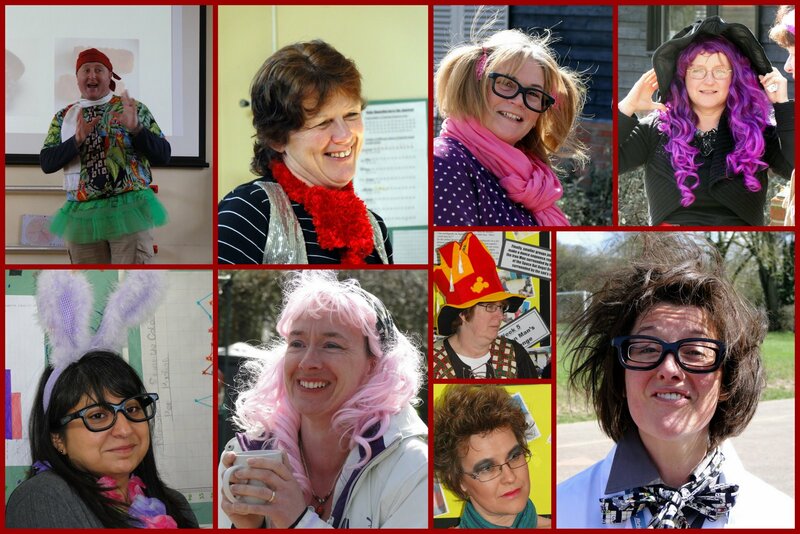 On Thursday 1st April, staff and children enjoyed a day of April Foolery by dressing up in weird and wacky costumes. Unsuspecting children were "cruelly tricked" by their teachers. Children from yellow class were sent to see Mr Mansell for various unusual items, including "a round to-it", "tartan paint" and "a long stand". And the children in Blue class fell hook, line and sinker for Google's latest services - "Google Translate for Animals" which promised to allow users to translate their pet's barks and miaows into English via their Android phone and "Google Store Anything" which would let them upload any item (ie. their car keys, or even the family dog) to Google's servers so you would never be without it! 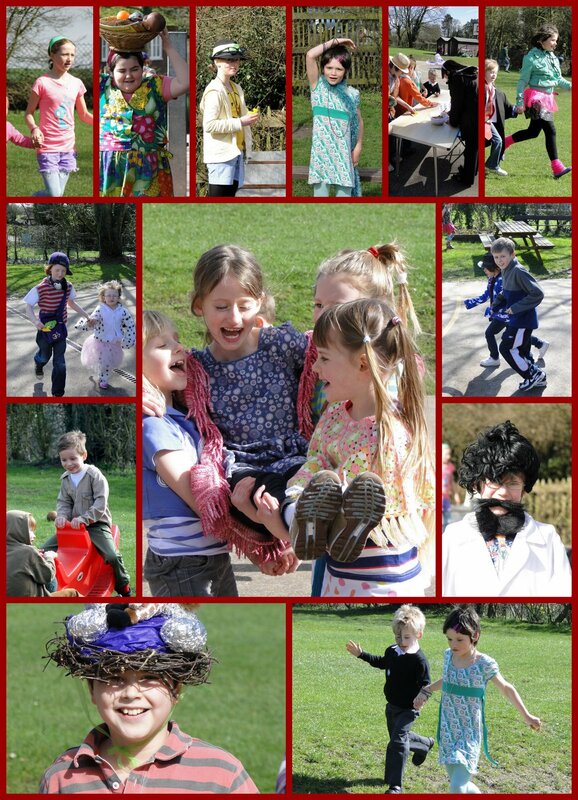 There was also a fantastic Easter Egg Hunt which saw the children working together to match clues to be rewarded with eggs. Everyone had a really enjoyable last day of term.